The geology intersected along a tunnel is an overriding factor in many of the decisions that must be made in planning, designing, and construction. 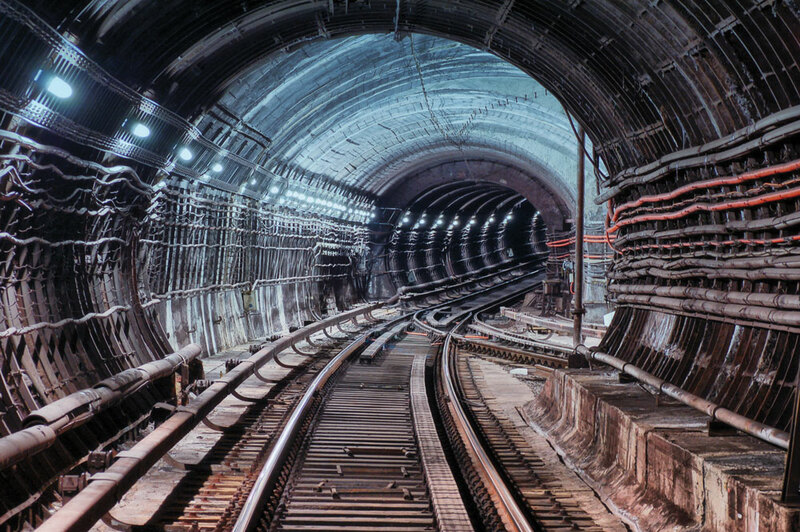 During planning and design, the geotechnical engineer must anticipate the behavior of the tunnel under several excavation and support scenarios. His or her ability to predict this behavior is critical for an accurate cost estimate as well as on-time delivery of the project. Geotechnical interpretation should be performed carefully to take into account the significant geology while accounting for the uncertainty associated with underground design and construction. Due to the unique nature of each project, there are no fixed standards or check-off list that can be used to fully determine the scope or provide a comprehensive how-to guide. A knowledge gap is almost always present between what is obtained by the client during the design phase and what is required by the contractor for equipment purchase and construction. This knowledge is often the underlying cause for contract disputes. Therefore if additional effort is spent early in the project to minimize this knowledge gap, the payoff in safety and project performance should easily offset the additional cost. A number of clients and contractors underestimate the importance of the geotechnical input. This does not become apparent until the project starts to run into significant cost and/or time overruns. TBM manufacturers construct equipment according to the provided specifications and take no responsibility for errors in geotechnical interpretation. Input from the geotechnical engineer should be considered both early in the project scoping and continuously sought during construction. 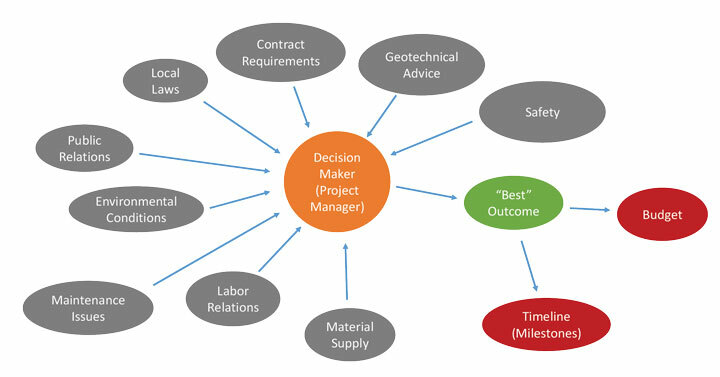 This paper sets out to provide both a ready reference to project managers as to when and what input they should seek from geotechnical engineers and give guidance to geotechnical engineers on how to present information to project managers in such a way that they can make informed decisions around project management, reducing disputes and ultimately providing better outcomes for the industry. TBM selection is critical to the success of the project. Once made, this decision cannot easily be changed. Tunnel purpose, type and design are not the only criteria to select TBM! 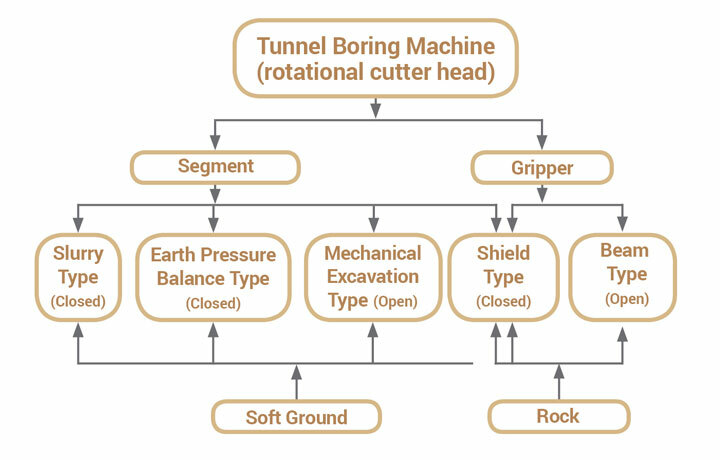 TBM Quick selection chart Figure 1, which is used by a lot of contractors, is not the recommended method to select the TBM. Figure 1 – TBM quick selection chart (General). There are a few variants to these main types, e.g. 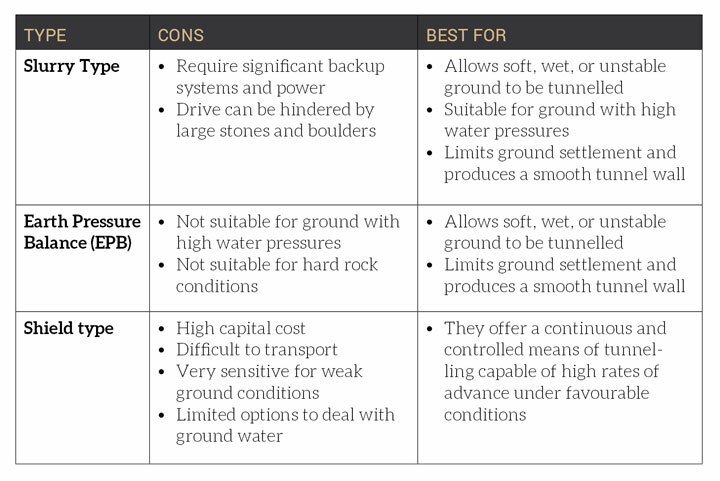 “Mechanical Excavation Type,” “Beam Type,” “Mixed Shield Slurry Type.” Table 1, however, is sufficient to demonstrate the idea. As you can see from the Table 1, prior knowledge of expected ground conditions is critical. Hard rock may be indicated during feasibility studies based on limited core drilling. This would result in the choice of a Shield type TBM. If a large number of faults are present in the rock this would mean much of the ground will be weak or variable, in which case it would have been better to choose an EPB TBM. This type of mistake is costly. The choice of TBM should be a collaborative exercise between the geotechnical engineer and the procurement/tender team. As the project matures, the amount of information will increase, however as decisions are made and capital is spent the ability to change will decrease. Both geotechnical engineers and project managers need to understand this dynamic and the pressures it creates. After selecting the TBM type then the geotechnical engineer should still be actively engaged during the design and manufacture as there are many variables that will affect the performance of the TBM. Examples include design of cutterhead, maximum trust and torque, over-boring, probing and ground improvement capabilities. Of secondary importance is the fact that during this stage any further geotechnical assessment will allow for optimization of the TBM which will increase performance. There will always be pressure to reduce costs however understanding consequences of each compromise must be appreciated in each instance. Saving money on a probe drill may make it impossible to conduct adequate probe drilling ahead of the cutterhead during maintenance periods, creating the situation where you need to either mine without sufficient cover, delay mining to achieve the required cover or purchase and fit better drills during excavation. The third choice may not always be possible. 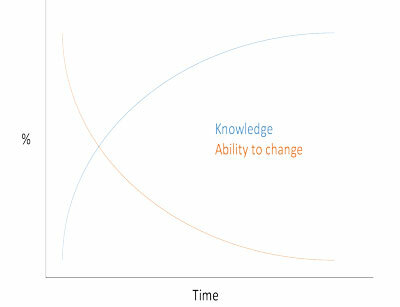 Figure 2 – Knowledge vs Ability to change over time. Nobody likes surprises. TBMs do not like surprises. Project managers do not like surprises. Any geotechnical engineer who wants a long career in tunnel boring would do well to remember this. Conditions in the tunnel can change quickly transitioning from minute to minute or week to week in conditions ranging from very wet to very dry, and from soft ground to hard rock. Prediction of ground conditions ahead of the cutterhead both good and bad along with expected impacts on advance. Providing solutions to allow advance rate to be maintained. Advise as to when mining can or cannot be stopped and advise if this will require a contract variation from the client. Analyze performance of the TBM and provide understanding to the project manager as to why variation is occurring. Monitor ground conditions and responding to mining and updating the geotechnical model to enable better predictions. Project managers are specialists in their field they are not geotechnical engineers. The jargon used by geotechnical engineers is often confusing and does not provide the knowledge required to make decisions. Project managers constantly have to weigh up conflicting priorities and advice as per Figure 3. Geotechnical engineers need to understand this and provide information in a way that makes sense. Recommendations must be free of jargon and must be given in context. For example, the engineer may detect increased cutterhead torque due to mining through a fault and is aware that the TBM is required to stop for maintenance within the next few hours. Do not tell the project manager the torque is high so he cannot stop. This does not provide context and will create a direct conflict with the mechanical engineer and contract requirements so the advice will probably be ignored. If the geotechnical engineer explains that stopping now would result in the cutterhead being stuck and that if the stop was delayed for 50 m or so when better ground conditions are expected, the TBM could safely be stopped for maintenance. A variation would need to be obtained from the client and the maintenance schedule would need to be adjusted. The geotechnical recommendation would be far more likely to be followed and this would produce a better result for the project. In addition to making the recommendations clearer, i.e. in terms the project manager is familiar with, the geotechnical engineer should collect supporting data from additional sources such as sampling and analyzing rocks from the stockpile and/or reviewing probe drill data and use these to build a convincing argument. In the modern highly mechanized world of TBM tunneling the geotechnical engineer has access to many methods of collecting raw data from dozens sources both on the TBM and around the site. The geotechnical engineer needs to translate the data into knowledge and wisdom and share that with the project manager. Data and information, while critical to the geotechnical engineer, is useless to the project manager and will only confuse the issue if not presented in a clear and concise manner. No project no matter how much time and money is spent up front will ever have all of the information. By getting good geotechnical advice early in the project and then continuing to work with the geotechnical engineer during TBM selection and design, the project manager will more likely to be able to succeed. An experienced project manager understands that the competence and experience of the geotechnical engineer can make the difference between meeting the project goals or incurring delays and additional costs. The ability of these two people to understand each other and work together during the construction of the tunnel is critical. The geotechnical engineer must try to understand the pressures that the project manager is under the conflicting priorities that he must resolve daily. Deliver knowledge and share wisdom and becoming an ally rather than just another source of conflict that has to be resolved. Geoffrey Potgieter is Operational Services Superintendent with Glencore Copper Australia. Omer Yeni is a Senior Rock Mechanic Engineer with Glencore Copper Australia.